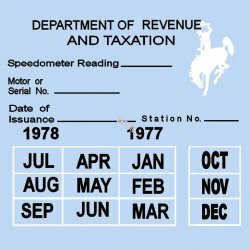 1977-78 Wyoming Inspection Sticker - $20.00 : Bob Hoyts Classic Inspection Stickers, Add a Final Touch to your Restoration! This 1977-78 Wyoming INSPECTION sticker was carefully restored and reproduced to completely remain faithful in color and size, front and back, to the original. It has a new modern "Peel and Stick" adhesive which allows you to place it on the inside windshield (Drivers side), like the original. Thanks to my good friend Ed Keyes, Phoeniz AZ, who helped me find the original in a Phoenix junkyard.